The Day Of Planning Package is really better described as month of service. Our brides who utilize this service are handling all aspects of the planning process on their own but recognize the value of having a third party coordinate all the details those last few weeks leading up to the wedding day. With the Day Of Bride we begin around thirty days out from the wedding. At this point we will set up a call or meeting to discuss all the details of the day. We get the vendor information and begin to contact them to come up with a master timeline for how the day will flow. We will meet with the bride for a final walk through of the venue space to learn the layout and where you envision seeing everything from the food and cake to the welcome book and favors. Day Of Brides often have welcome gifts for their out of town guests, and we will even take care of delivering these to hotels for you. When it comes to the wedding weekend we are your right hand gals. We're there to coordinate and run your ceremony rehearsal, set up all of your personal items and break down the wedding itself. We are there on site for up to ten hours on the wedding day. We are there to ensure every vendor is on time and performs the tasks you hired them to do. We stay through to the end of your reception and make sure all of your personal items and gifts are packed away leaving you and your family to enjoy the festivities. Please let us know if The Day Of Planning Package meets your needs. We would love to get started with you today! Click here to see more images from this gorgeous wedding captured by Rae Leytham Photogarphy, designed by mother of the Groom- Lorna Huey and Wildflower. Welcome back for the second week to talk about our different packages and services that can help you bring your dream day to fruition. Today we will go over our Full Service Planning Package. This package is focused on the wedding itself. Full Service Brides are offered unlimited meetings Monday through Thursday during business hours and emails as well as complete management and coverage of all aspects of the wedding day, and ceremony rehearsal. Our design team works hand in hand with you to create a mood board based on your vision, and communicates with each vendor on your behalf to make sure these plans come to life. We will go with you to the florist to design your bouquets and centerpieces. 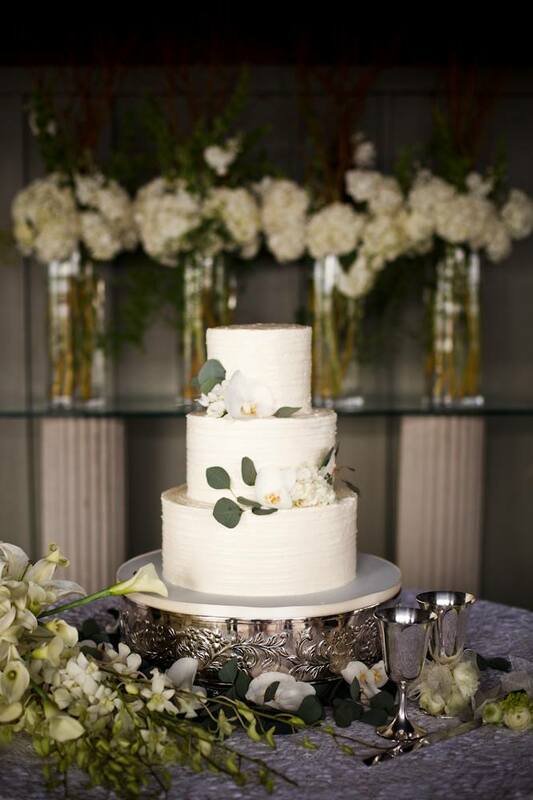 Help you pick out linens, china, chairs, and furniture at the rental company, and even work with you to pick out your catering and bar menu and favorite cake flavors. All weekend merchandise can be customized with us from your napkins to your welcome boxes. We will even assemble and deliver these to the hotels where we have set up room blocks for your guests. We begin with these clients at the very beginning. Working on design plans, and over all vision down to the finite details as well. The Full Service Planning Package includes budget management and monthly step by step to do lists. Full Service Brides are also able to take advantage of our custom paper designs for their entire wedding suite. 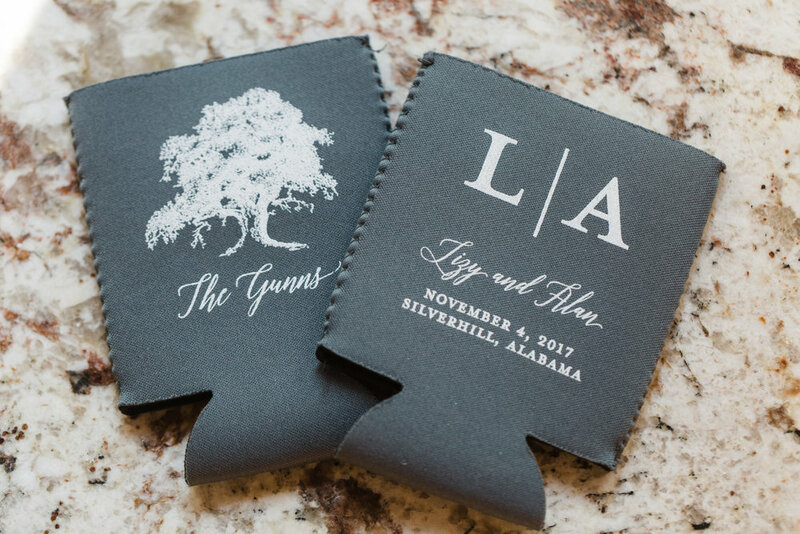 Our team can design your save the dates, invitations, programs, koozies, you name it. 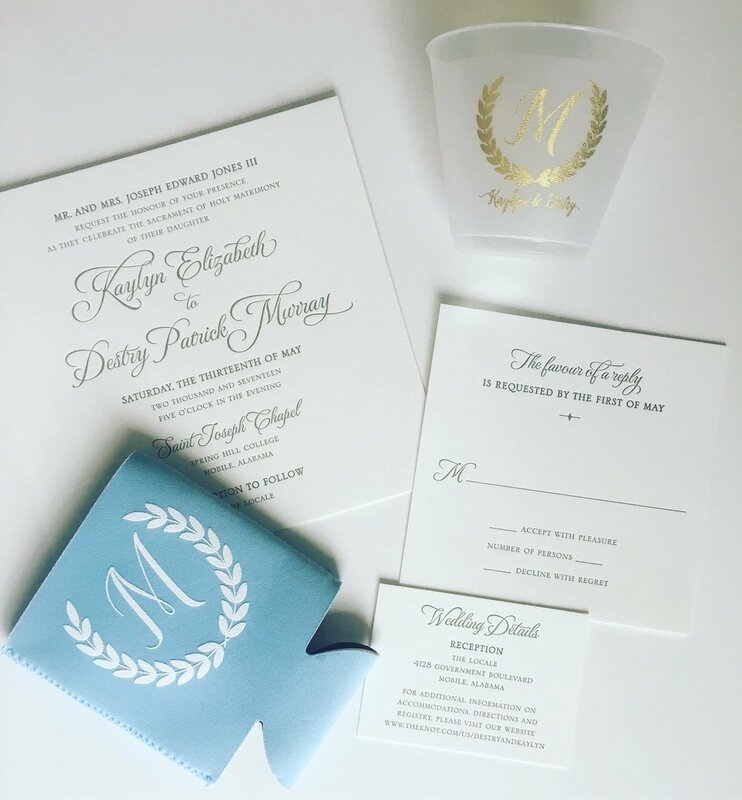 Jenna Laine Weddings has an in house graphic designer who can create custom logos and crests for all of your wedding paper and accessories. When it comes to wedding week we are your right hand gals. We are there to coordinate and run your ceremony rehearsal, and again on the wedding day to set up and break down the wedding itself. Your planner and an assistant will be on site from start to finish, ensuring every vendor is on time and fully equipped to make your event go off without a hitch. They will stay until the end of the evening to ensure your personal items are packed away, leaving you and your family to enjoy the festivities. Please let us know if The Full Service Planning Package sounds like exactly what you need. We would love to get started with you today! For those of you just beginning the wedding planning process we thought we would take a few weeks to go over our different packages and services that can help you bring your dream day to fruition. We will start with our Premium Planning Package. Clients who choose this package really do get it all; unlimited meetings at your convenience, unlimited emails, and complete management and coverage of all aspects of the wedding AND rehearsal dinner. Your planner will work on all logistics, the over all vision, down to the finite details. The Premium Planning Package includes budget management and monthly step by step to do lists. In short, we are with these brides and often their families for every meeting and decision throughout the engagement and wedding. Our design team works hand in hand with you to create a mood board based on your vision, and communicates with each vendor on your behalf to make these plans come to life. We will go with you to the florist to design your bouquets and centerpieces. 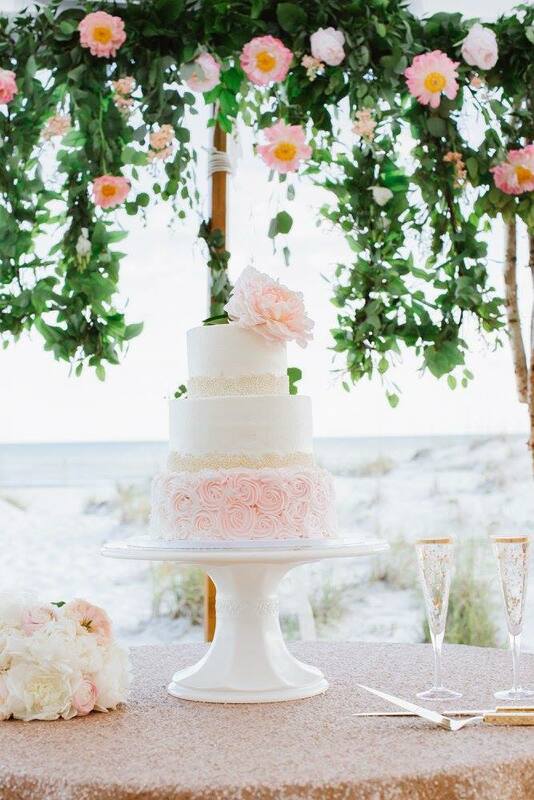 Help you pick out linens, china, chairs, and furniture at the rental company, and even work with you to pick out your catering and bar menu and favorite cake flavors. All weekend merchandise can be customized with us, from your napkins to your welcome boxes. We will even assemble and deliver these items to the hotels where we have set up room blocks for your guests. We also offer custom paper design from which Premium Brides are able to create their entire wedding suites. Our team can design your save the dates, invitations, programs, koozies, you name it. Jenna Laine Weddings has an in house graphic designer who can create custom logos and crests for all of your wedding paper and accessories. We can stuff, stamp, seal and send your invitations so that you have one less thing to worry about with your busy schedule! When it comes to wedding week we are your right hand gals. We are there to coordinate and run your ceremony rehearsal, set up and break down your rehearsal dinner, and on the wedding day to set up and break down the wedding itself. Your planner and an assistant will be there on site from start to finish, ensuring every vendor is on time and fully equipped to make your event go off without a hitch. They will stay until the end of the evening to ensure your personal items are packed away, leaving you and your family to enjoy the festivities. Please let us know if The Premium Planning Package sounds like exactly what you need. We would love to start your planning process today!